Relive the Chicago Blaze history in action as we follow the team to their build up to the Championship! Insider stories are shared. It is Chicago history presented through the former manager’s unique point of view. 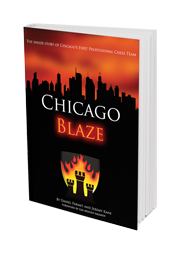 The Chicago Blaze chess team represented the Windy City in United States Chess League from 2008 to 2011. In 2011, the team made the championship finals where they lost to the NY Knights. This book contains stories, photos, puzzles and analysis by team members of the 176 games. 169 games are annotated including 16 by GMs & 15 by IMs (6 by Yury Shulman, 5 by Dmitry Gurevich, 4 by Mesgen Amanov, 1 by Josh Friedel, 6 by Jan Van de Mortel, 6 by Angelo Young, 2 by Florin Felecan, 1 by Eric Rosen), analysis by 5 other team members of their games (FM Jim Dean, NM Gopal Menon, NM Trevor Magness & NM Todd Freitag), FM Albert Chow, Daniel Parmet and over 100 games by NM Jeremy Kane. WANT TO READ A SAMPLE? GREAT. I'LL SEND YOU ONE.